Comment A recent New York Times profile portrayed Facebook COO Sheryl Sandberg as the megacorp's human side – in contrast to reptilian boy emperor Mark Zuckerberg. While Zuck once chose to deny, quite categorically, being a lizard – "I'm gonna have to go with 'no' on that," he replied – Sandberg often plays the caring, human half of Facebook leadership. But startling new evidence casts doubt on the theory that Sandberg is humanoid. Fast Company magazine this week asked top tech CEOs what books influenced them and inspired them most as a child. Now what do you suppose they chose, dear reader? One by Roald Dahl? Or by Dr Seuss? Or Biggles? 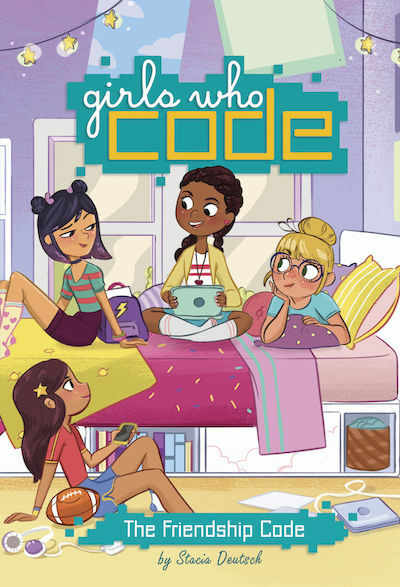 Sandberg nominated Girls Who Code: The Friendship Code by Resmas Saujani, founder and CEO of Girls Who Code. "Lucy is super excited about coding club at school. She has an idea for an app, and can't wait to get started!" the blurb burbles. According to Fast Company: "The book cleverly weaves together a story about friendship with actual snippets of code." It was only published last October, when Sandberg was 48 years old, so it's a stretch to call it a book that inspired her childhood. "Rosie lowered her voice to a whisper. 'And when I grow up,' she confided, 'I want to gather all the personal data in the world and sell it to advertisers.'" Sundar Pichai, CEO of Google, appears to be another executive having a late childhood. Pichai chose The Wild Robot by Peter Brown, published in 2016, when Pinchai was (by our calculation) 46 years old. Why did he choose this classic. Was it for the riveting plot, or memorable characters? Give your silly head a shake. It's because (as Pichai's representative on Earth tells Fast Company) it's about "how automation interacts with creativity. This resonates with what Pichai does at Google, which involves ensuring that technology adapts and responds to the human needs of users." Melinda Gates doesn't deviate either. She chose a 2013 book, Rosie Revere, Engineer. That has an Inspiring Message too, and you can guess what that may be. Today's tech CEO cannot slip out of a narrowly defined character. The PR mask must remain fixed in place, even if it takes superglue. They must remain aggressively on message. At this point, it is worth noting that the most coveted school in Silicon Valley is the Waldorf School of the Peninsula, which is coveted precisely because it bans the casual use of digital technology. "Today's children spend far less time than earlier generations engaging with other children, caring adults, and nature," the school's marketing material purred. "The lure of electronic entertainment in our media-infused society influences the emotional and physical development of children and adolescents on many levels, and can detract from their capacity to create a meaningful connection with others and the world around them. "Waldorf educators believe it is far more important for students to interact with one another and their teachers, and work with real materials than to interface with electronic media or technology. By exploring the world of ideas, participating in the arts, music, movement and practical activities, children develop healthy, robust bodies, balanced and well-integrated brains, confidence in their real-world practical skills and strong executive-function capabilities."